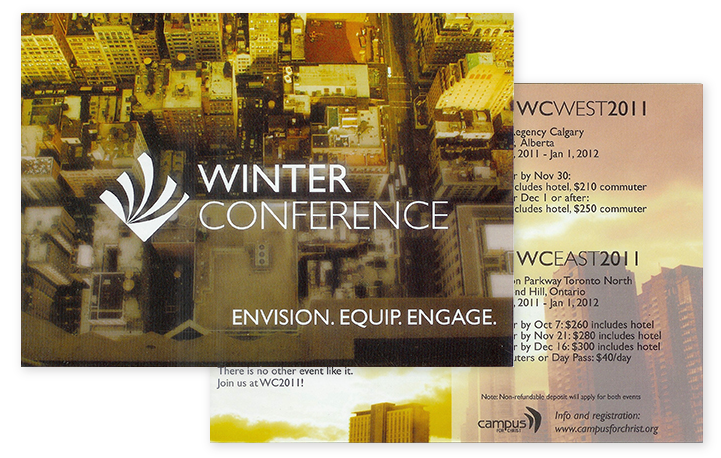 Winter Conference’s logo was created while I was interning with a Christian organization in Waterloo in 2009. The organization wanted a logo that could be paired with the grunge look that was popular, and that alluded to the celebratory nature of the conference. Previous iterations of logos for this event included imagery of overpasses (referencing the fact that the conferences took place in Toronto and Calgary) however it was decided that these evoked stressful driving. The shapes in the diamond reference banners and streamers hung on the ceiling, while the single point of convergence leading to four paths was meant to evoke the fact that the conferences were created to equip and inspire the attendants to move forward on their spiritual journeys.